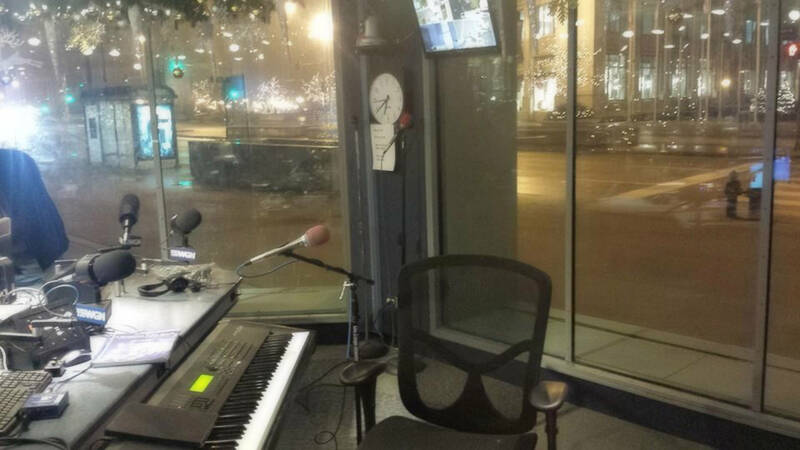 This morning, Felix and Fingers made a guest appearance on Chicago Radio’s WGN 720AM. Thank you to Piano Trends for the sponsorship and providing the keyboard. And a big thank you (as well) to Mr. Fix it, Lou Manfredini. If you are wondering how a concept such as WGN Dueling Pianos could work, the answer is quite simple. Follow the main rule of each and every one of our shows; Have FUN! Mike Sherman played and sang for this event. During one portion of the show, he would start a Christmas song, and a live guest (anyone passing by) would have to chime in and sing the correct lyrics to win a prize. And what could be more appropriate for a prize than a shower head with a built in radio? As commercial breaks came, Mike would play transition music to create that subtle yet seamless listening experience. As for Mr. Fix It’s regular format, he took a lot of questions as usual. For some reason, almost all of them were about fixing toilets. Signing off, this is Felix and Fingers Dueling Pianos wishing you happy holidays and a working toilet!